Southeast Side manufacturer Agri-Fine Corp. faces a possible class action lawsuit. JEFFERY MANOR — Southeast Side homeowners have filed a lawsuit seeking class action status against Agri-Fine Corp., alleging that the animal feed manufacturer damaged their property with noxious odors from its plant. Chicago law firm Sneckenberg, Thompson & Brody LLP and Detroit law firm Liddle & Dubin PC are representing the homeowners. “We’ve been contacted by as many as 200 homes,” attorney Steven Liddle said Monday. "There are hundreds of people complaining about it. It’s not just three irate neighbors." The class action suit against Agri-Fine echoes allegations laid out in a separate complaint brought by the Illinois Attorney General’s Office in November. 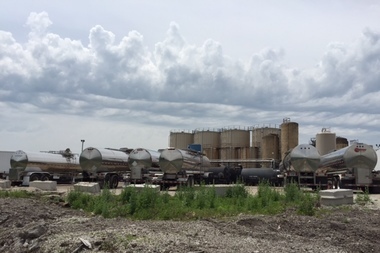 Illinois Attorney General Lisa Madigan accused Agri-Fine of violating the Illinois Environmental Protection Act by spewing higher-than-permitted levels of sulfur dioxide and hydrogen sulfide from its Southeast Side facility. Both gases correlate with increased levels of respiratory illness, according to the U.S. Environmental Protection Agency. DNAinfo Chicago found hundreds of complaints filed against the company going back as far as 1993. "What the state is addressing is the public trust — the ambient air,” Liddle said. "What these [plaintiffs] are looking to address is their own personal property." Liddle & Dubin specializes in class action environmental lawsuits and previously won a $12 million settlement in Caines v. Marathon Oil Co., a case of “chronic noxious odors and air pollution released from an oil refinery,” according to the firm’s website. Agri-Fine Chief Operating Officer Erik Hoelzeman declined to comment on the pending suit. Hoelzeman previously told DNAinfo Chicago that his company had spent "millions" on odor-control measures but thought that some complaints against his company were made in error. Agri-Fine was previously represented in the case of the Attorney General’s complaint by Chicago attorney Mark A. Stang, a former partner at Chuhak & Tescon PC. The firm filed a motion June 10 to withdraw from the case, stating that Strang no longer worked for the company. Stang did not return calls for comment Monday. A representative for Chuhak & Tescon said the company does not comment on pending litigation or attorneys who have left the company. Meanwhile, Liddle & Dubin has invited residents of Jeffery Manor, Veteran’s Park and South Deering to meet with its attorneys at a series of public information meetings scheduled for Wednesday. The firm has rented a room at Sacred Heart School, 2926 E. 96th St., and will conduct meetings at 6, 7 and 8 p.m.